VRF-1 "Stork" Insignia 1943-45 . Photo of leather patch sewn on pilot's flight jackets. 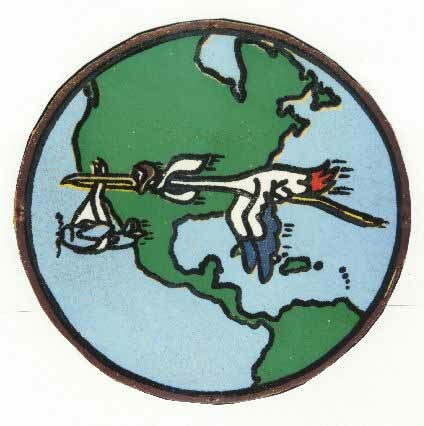 "A be-goggled, red-white-and-blue, streamlined stork, winging across a map of North America carrying a F6F 'baby' is the flashy new squadron insignia adopted by Ferry units at NAS, NY. The insignia has been officially approved by the Bureau of Aeronautics. Ferry Command personnel are showing the stork insignia on automobile windshields, luggage, and on airplanes permanently assigned to the field. In addition, a large number of full-color leather labels are being prepared in the Ferry Chart Room. They will be sewed on the jackets of officers and men." From "Skyscrapers" Vol. 1, No. 46, June 10, 1944; Weekly news magazine of US Naval Air Station New York. From a staff of 10 pilots who ferried planes in their spare time evenings back in 1941, the Naval Air Ferry Command has grown until it now has a thousand pilots who fly everything from fighter planes to big four-engine Liberators from coast to coast. The ferry squadrons can fly anything with wings, at a few hours' notice, to the four corners of the nation, Canada or overseas. Most of its operations are in continental U. S., but special ferrying jobs sometimes take its pilots to South America or ocean bases. To keep such a heavy flow of air traffic moving smoothly with a minimum of accidents requires constant pressure on safety and proper pilot procedures. NANews reproduces on these pages information on correct procedure, which is stressed with all ferry pilots. Much of the advice is applicable to all Navy pilots since it involves proper methods to use in any flying, cross-country or merely around an air base while training. Beginnings of the Naval Air Ferry Command, which is now under the Naval Air Transport Service, were modest. For example, the work at NAS New York was done back in 1941 by reserve pilots who instructed day times and ferried evenings and weekends. They drove their private cars to nearby Grumman plant, picked up s Wildcat fighters and ferried them back to the station. Fleet units picked up the planes there. Principal types flown then were Kingfishers, Brewster Buffalos, Wildcats and the Grumman Goose. Flying personnel of the Aircraft Delivery Units later became the Ferry Command on December 1, 1943. Part-time ferry piloting was expanded when half a dozen naval aviators were called in to help carry the load. Because of the large number of Navy planes being turned out today, the huge ferry squadrons, largest in naval aviation, are kept busy most of the time flying new fighters and bombers to the west coast and bringing back battle worn fighters, SBD's and other types, or new planes built on the Pacific slope. This diversity of types requires that ferry pilots know how to fly many kinds of airplanes. Besides the F6F, F4U, TBF and SBD, the most common types flown, ferry squadrons also are called on to deliver such others as J4F, JRF, J2F, F3A, FM, TBM, SB2A, PV, SB2C, FG, R4D, GH, PBJ, JM, SBW, TDR, SNV, BTD, N2S, F4F, F7F, PBY and PB4Y But pilots naturally cannot be masters of all kinds of planes. Major transcontinental and coastal ferry routes are laid out with frequent airports designated as stops. At these places, ferry service units or auxiliary FSU's are located to keep the planes serviced and in flying trim. 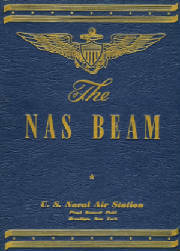 The tremendous scope of naval aviation today is best indicated by the fact that the Ferry Command's pilots in VRF-1 alone have flown 15,000,000 miles on actual ferry trips, not counting checkout flights or tests which pilots may take to familiarize themselves with the particular plane they may be ferrying. Training of some ferry pilots is done at NAS Willow Grove Pa., where they spend a month refreshing themselves on engines, ground work and plane checkouts, and generally getting themselves ready for the job of ferrying planes. Pilots' lives are valuable and airplanes are expensive, so constant pressure is maintained by the Ferry Command on safety and observation of proper flying procedures. Younger, inexperienced pilots sometimes have a tendency to break formations, flat-hat and commit other breaches of aerial etiquette. To encourage safety-consciousness, VRF-1 maintains in its ready room at NAS New York a "Glory Board" listing names of pilots with outstanding records. A pilot who completes five transcontinental flights, or the equivalent 13,500 miles in coastal hops, without accident, has a gold pair of Navy wings after his name. Twenty-five flights entitle him to a "stork," insignia of the squadron. The board at present has 194 members listed, with 124 boasting one or more "storks." Champion pilot of the squadron has completed 92 transcontinental trips, a total of 276,000 miles, without accident. If a plane is slightly damaged during its delivery flight and can be repaired and continue the flight, the pilot will not get credit for the trip. If it sustained major damage, the pilot loses credit for that flight, plus one other to set him back. Delivery of 25 airplanes without any damage wins a special merit award or a "medallion." The Ferry Command transports thousands of military personnel-Army, Navy or Marine alike-on leave or on orders. This carrying of passengers resulted in a unique experience for one ferry pilot flying a TBF on the west coast some time back. After taking aboard an enlisted man as passenger, he found his inter-communication system did not work. He instructed the sailor to tie a rope around his leg and to bail out if he should jerk on it in case of emergency. Out over the desert the cockpit enclosure started to fly off and the pilot seized the rope to tie it down. When the pilot landed the TBF at the next station, there was no sailor aboard. Search was launched and he was found, none the worse for his parachute jump except for a cut on the head. He had bailed out in the South Pacific on past occasions and had not stopped to argue when the ferry pilot jerked the rope while lashing down the enclosure. Who are the ferry pilots? Calling the roll on VRF-1, for instance, would reveal such widely divergent experience as skywriters, commercial airline pilots, barnstormers, plane salesmen, lawyers, CAA pilots, aviation cadets right out of Pensacola or Corpus Christi, aerial circus fliers test pilots and graduates of operational training. Many ferry pilots are former fighter or bomber pilots with the RAF or RCAF who returned to the services of the United States. The nucleus of Ferry Command is composed of men with long experience flying, some with as much as 20 years. The commander of VRF-1, for instance, has over 8,000 flying hours. Some are nearly 50 years old, with the average age in the 30's. Frequently, when a rush job of ferrying arises, a few score of comparatively green pilots are borrowed to fly fighters to the west coast or do whatever needs to get the job done in a hurry. It is among this group-pilots whose eyes are on the Central Pacific where they are headed instead of on the instrument board of the plane they are flying-that many of the Ferry Command's accidents occur. The more experienced men are the lead pilots, with the younger men following them, but the older pilots still think they can hold their own in combat. Recently VRF-1 polled its men and more than 100 volunteered to form a fighter squadron for active duty in the Pacific. 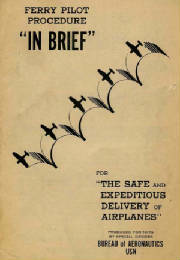 The plan was not carried out in this manner when it was found impractical to keep them together as a fighting unit-the idea being to test whether the "graybeards" would be good fighter pilots because of their long experience with handling planes and meeting all conditions of aerology and the enemy, but 20 of them are being sent to operational training for this purpose. Although they have many hours in the air, pilots are not allowed to lose touch with aviation progress. Instrument work is given constantly in the air or in Link trainers. All ferry flying, however, is contact. Three naval air stations are the main operating bases of the Ferry Command-NAS New York, home of VRF-1; NAS Columbus, where VRF-2 is based, and NAS San Pedro, where VRF-3 is located. VRS-1 is based at New York, [and VRF-4 at NAS New York]. In the early days of ferrying, flights consisted of five or six planes in formation, but today there usually are only three-a lead pilot with two follow pilots behind him in a loose v. To qualify as a lead pilot, an aviator has to have made at least six transcontinental trips. Pilots assigned to VHF'S are classified as senior ferry pilots, lead pilots, single pilots and follow pilots, according to their experience and their ability to deliver planes undamaged and on schedule. Each classification has its set of qualifications. For ferrying purposes, the United States is divided into an eastern and western zone, with the Mississippi River the boundary. Transcontinental ferry flights go by several alternate routes to Texas and west by the southern route. Ferry service units are located all along the routes, with auxiliary units at smaller airports, to keep the planes in operating order. FSU's are at Knoxville, Fort Worth, Little Rock, Lynchburg, El Paso, Tucson, Petersburg, Va., Red Bluff, Calif., and Spartanburg, S.C. AFSU's are at Tulsa, Midland, Tex. ; Shreveport, and Madera, Calif. Routes also extend into Canada and north-south on both coasts. Cross-country flights entail considerably more paper work than is encountered by short hops around a naval air station, at the start, during the flight and when it is completed. The pilot's pre-departure hours are filled with checking maps, radio frequencies, collecting gear and chutes, cross-country packets - with damage reports, bills of lading and supply and service forms, instructing passengers and finally checking?out on the plane to be ferried to learn its peculiarities, fuel system and consumption. Confidential gear and plane equipment have to be under guard at all times, either by the pilot himself or station police. Ferry flights usually start about 0900 and are supposed to be completed for the day by sunset. Strict adherence to flight rules and CAA airway regulations while flying cross-country are necessary to insure a minimum of accidents. One squadron found that men right out of flight training made the poorest ferry pilots, many fatal accidents resulting. Constant attention to the little details of flying are necessary to keep down the accident total in ferry flights, just as it is with smaller operations. Before taking off, the tower must be checked for clearance. In the air, the flight plan filed with airways authorities must be adhered to and proper use of radio followed. Instrument flight is barred and flat-hatting is an unpardonable sin. One ferry pilot broke formation, buzzed his home in Texas and crashed his plane, killing himself. Steep climbs on take-off and racing between ferry stops are on the list of forbidden actions. Some ferry pilots have had to be warned about flying too close to transport aircraft, others because they taxied too fast or failed to S-turn to improve visibility. A third of all accidents on ferry occur during landings, many because of failure to go over the check-off list beforehand. Another 25 percent are as a result of forced landings, in which pilot error often is a contributing cause. When delayed by accidents or crashes, pilots are required to stand by their planes until some naval authority takes over. They are responsible for daily reports to headquarters on flight progress and for filling out the necessary reports due before take-off and upon arrival at destination. In case of crashes near Army air facilities where naval air operations are not near at hand, cooperation of that service may be utilized, although pilots are instructed not to abuse the privilege. Ferry squadrons and service squadrons have to be notified in case of accidents so that repair parts, modified orders and substitute pilots may be dispatched, if necessary. Fliers forced down have to close their flight plans and notify nearest ferry control liaison officers, then file damage reports. Routine to be performed on arrival at final destination includes filing of flight records and forms, having orders endorsed, logs on the plane, engine and propeller filled out, maps returned, unless future flights are to be made over the same route, and the final arrival report made out. The lead pilot must see that others in his flight observe regulations. Between December 1943 and November 1945, the Naval Air Ferry Command, headquartered at Floyd Bennett Field, ferried 75,000 aircraft. VRF-1, the largest of the command's four ferry squadrons, based at Floyd Bennett, ferried 46,000 aircraft, in 450,000 flight hours, over 80,000,000 miles. Between the ADU and Ferry Command, 1941-1945, nearly 100,000 Navy aircraft were deployed. We of the Naval Air Ferry Command, although not in direct contact with the enemy in the performance of our duties, have a vital and direct link with the fleet and those engaged in combat. By the safe delivery of virtually all the new production service type aircraft to the fleet commands, we insure an adequate flow of the aerial means for the accomplishment of the mission of the Navy - the destruction of the enemy. By furnishing pilots for training and assignment to duty with the fleet, we participate, ourselves, directly and indirectly, in actual combat. It is no coincidence that former pilots of the Ferry Command have flown in combat the very airplane they formerly ferried to the shoreline where it was delivered to the fleet. Enlisted personnel of this Command are receiving experience and training in the maintenance, repair, and as members of flight crews, of combat aircraft. This better fits them for duty afloat and overseas with these very aircraft. The Ferry Command, and its accomplishments, brings us fair pride in the part we have played, and are continuing to play each day, in delivering, safely and expeditiously, the critical combat aircraft that the fleet needs to complete the utter destruction of our enemies in this war. 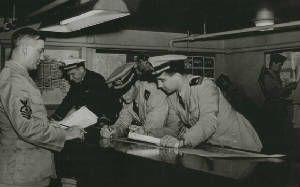 The Naval Air Ferry Command was commissioned on the first of December 1943. 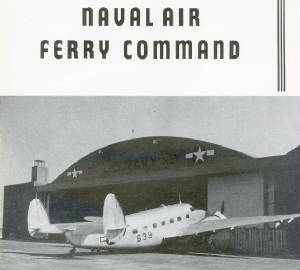 While the predecessor Aircraft Delivery Unit was under local command of NAS New York and the Bureau of Aeronautics, the Ferry Command was an air wing of the Naval Air Transport Service, under the Chief of Naval Operations. The ferry command was a much larger and more complex operation than the ADU. Wartime aircraft production was reaching its peak, and the Navy needed an organization able to keep up with the scale and complexity of maximum aircraft production from plants across the country. NAS New York was the command headquarters (all squadrons), and base for squadrons VRF-1, VRS-1 and VRF-4. The Ferry Command was housed in Floyd Bennett's Hangars 9 and 10, except VRF-4 was in Hangar B. The National Park Service demolished Hangars 9 and 10 in the early 1990's. Hangar B is still standing and serves as home to the Historic Aircraft Restoration Project. VRF-1 was the largest squadron in the history of the US Navy. The transfer of pilots from the ADU's Ferry Division to VRF-1 was believed to be the largest mass transfer of officers up to that time. VRF-1 Training Detachment - NAS Willow Grove. By December 1943, air traffic at NAS New York was so congested that the ferry command moved its training detachment to NAS Willow Grove Pennsylvania. Pilots received additional ground and flight training, and indoctrination into specific requirements of the ferry command. On June 1, 1944 an Aircraft Commissioning Unit (ACU) was established at Floyd Bennett Field to direct flights of airplanes from factory airfields to Floyd Bennett Field, and perform technical checks and installation of equipment and armament. VRS-1 was a service squadron formed from the Engineering Division of the predecessor ADU. 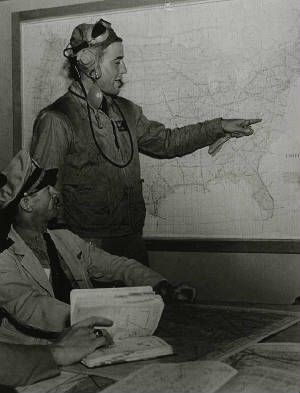 It was based at Floyd Bennett and included servicing and repair detachments at about 20 airfields around the country. VRF-4 was commissioned November 15, 1944 and was dedicated to acceptance and ferrying of the Navy's seaplanes. Seaplane production had dramatically increased and flying these planes required more specialized skills. VRF-2 was based at NAF Columbus, Ohio (Port Columbus airport). It deployed and ferried SB2C aircraft built by Curtiss-Wright Corporation. VRF2-D was based at Hensley Field in Dallas, adjacent to a North American Aviation plant. VRF-3 was based at NAS Terminal Island (San Pedro - in the Los Angeles harbor area), serving manufacturing plants in the area included Douglas Aircraft, and Lockheed in Burbank.